The miniPCS is a compact, self-contained, flight-ready particle sizer and counter. It works by the simple idea that, when passing through a “spotlight”, a bigger particle will reflect more light than a small one. Formally, the system employs linearized Mie scattering theory to correlate the intensity of the reflected signal with the particle size via a calibration procedure performed at the factory. The optoelectronics package of the miniPCS combines a few important characteristics to create a very versatile sensor. First, a laser is tightly focused into the built-in flow channel through which the particles are to pass (see figure). The tight focus makes for an extremely “bright” probe volume. A primary high-speed photodetector monitors this very narrow region of focus. This photodetector registers the light reflected from particles as they pass through. A secondary photodetector monitors the laser beam itself so that the system is completely immune to small changes in laser performance—that means it has an extremely long active lifetime without the need for recalibration. On the electronics side, the primary detector is digitized through a logarithmic amplifier, giving the sensor an enormous dynamic range. Particle sizes ranging from smoke to visible dust can be measured simultaneously without saturation. 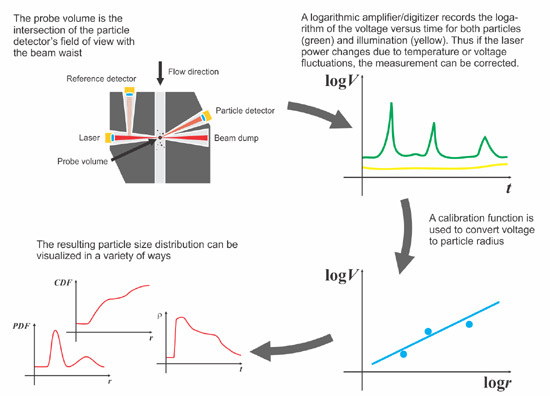 The extremely fast detector also allows for the counting of individual particles even when the densities are high. Typically miniPCS sensors are combined with GPS and small air pumps with filter cartridges to provide a flight-ready solution for launching on balloons or motorized aircraft. The pump is not necessary to “draw” particles into the flow chamber—it is used primarily to capture the particles that the miniPCS counts for further chemical analysis. The miniPCS system is extremely sensitive due to its tightly focused beam. At a recent scientific conference, the times of the coffee breaks could easily be distinguished from those during which presentations were being given because the miniPCS on display recorded large increases in particle count—the dust that people picked up as they walked across the exhibition area.